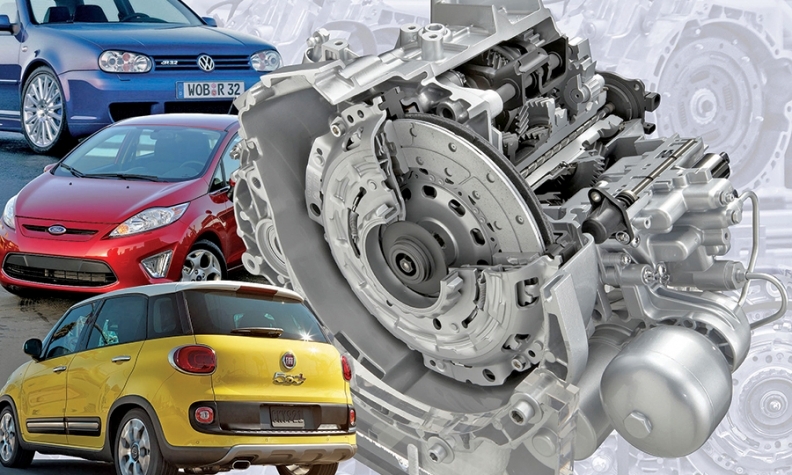 Once-promising dual-clutch transmissions lose favor in U.S. In 2003, the Volkswagen Fold was the first mass-market model to have a dual-clutch transmission. Other automakers, including Ford and Fiat, followed suit. However, Americans who aren't accustomed to the feel of manual shifting have rejected them. "In the past, transmissions were things you could count on, but that's no longer true." Not so long ago, dual-clutch transmissions -- with their superior fuel economy and lightning-quick gear shifts -- were widely viewed as the Next Big Thing. Automakers were counting on those gearboxes to improve fuel economy ratings 6 to 10 percent without compromising performance. After Volkswagen introduced dual- clutch transmissions in 2003, several mass-market automakers followed suit, only to encounter quality bugs and consumer complaints. Ford Motor Co. and Honda Motor Co. suffered a spate of complaints after introducing dual- clutch transmissions in the Ford Focus, Ford Fiesta and Acura TLX. And Fiat Chrysler -- which once planned to produce 700,000 dual- shift gearboxes a year in the U.S. -- has dropped it from its long-term plans for North America. Consumer Reports and J.D. Power have both reported a sharp uptick in complaints about faulty transmissions, as automakers seeking better fuel economy rolled out dual-clutch gearboxes, continuously variable transmissions and eight- and nine-speed transmissions. "In the past, transmissions were things you could count on, but that's no longer true," said Jake Fisher, Consumer Reports' director of auto testing. "We are seeing major problems that will leave people stranded on the side of the road." Dual-clutch transmissions are twin gearboxes linked by a pair of clutches. One gearbox handles the first, third and fifth gears, while the other covers the second, fourth and sixth gears. With one clutch for odd-numbered gears and the other for even-numbered gears, the transmission can pre-select the next gear the driver is likely to shift into. That allows quicker gear shifts than manual transmissions. And since the dual-clutch gearbox does not require a torque converter, it's more efficient than an automatic transmission. Supercar makers McLaren, Lamborghini, Ferrari and Porsche all adopted dual- clutch gearboxes, whose rapid shifts rendered manual transmissions obsolete. And in 2003, the Volkswagen Golf was the first mass-market model to feature a dual clutch transmission. After Volkswagen rolled out the "direct shift gearbox" for its namesake brand and Audi, the technology appeared ready for the mass market. In 2007, Chrysler announced plans to build a $530 million plant in Indiana that would produce up to 700,000 Getrag AG transmissions a year. One year later, Ford announced plans to build a $500 million transmission plant in Irapuato, Mexico, in a joint venture with Getrag. In 2010, the plant began churning out dual-clutch transmissions for the Ford Focus and Fiesta. But Chrysler and Ford both ran into trouble. In 2008, Chrysler pulled out of its joint venture with Getrag after it rejected the supplier's financing terms for the plant's tooling. That same year, the joint venture filed for Chapter 11 bankruptcy. Currently, just three FCA models -- the Dodge Dart, Fiat 500L and the Alfa Romeo 4C -- feature dual-clutch transmissions made by Fiat in Italy. And the company's powertrain strategy unveiled last May identified dual- clutch gearboxes as a promising technology in Asia -- but not North America. In the U.S., FCA is betting on eight- and nine-speed automatic transmissions, said Jeff Lux, FCA's North American vice president of transmission powertrains. Conventional transmissions "continue to evolve in efficiency," Lux said, "so there isn't much eagerness [at Fiat Chrysler] to make trade-offs between driveability and better fuel economy." Performance brands such as Ferrari and Alfa Romeo will continue to use dual-clutch gearboxes, Lux said, but there isn't much appetite for their use in mass-market models. Though growing, use of dual-clutch transmissions in the U.S. is below expectations. Meanwhile, Ford introduced dual-clutch gearboxes in the 2011 Ford Fiesta, followed by the Focus. But car owner complaints quickly piled up. The transmission worked well at highway speeds, but lurched or stalled in city driving, disgruntled owners said. On Jan. 1, 2011, Ford issued a technical service bulletin to dealers that noted the Fiesta's PowerShift transmission could suffer "a loss of power, hesitation, surge, or lack of throttle response while driving." The automaker issued a variety of fixes, including both software and hardware. As recently as February, Ford issued a "customer satisfaction program" to repair the transmission control module. And now the issue is getting hashed out in court. In 2012, the Los Angeles-based law firm Capstone Partners APC filed the first of three lawsuits in a U.S. district court on behalf of owners who claim their vehicles suffered repeated breakdowns. The firm's lawsuits in the Central District of California seek class-action status. Contacted last week, Capstone attorney Tarek Zohdy declined to indicate how many plaintiffs were expected to join the lawsuit. Ford spokesman Paul Seredynski also declined comment. But judging by complaints to the National Highway Traffic Safety Administration, it seems possible that the number of plaintiffs could run into the hundreds or even thousands. (See sidebar, Page 4.) Over the past four years or so, NHTSA's SaferCar.gov has logged approximately 500 complaints about Ford's transmission, according to Capstone's count. Numerous software and hardware upgrades have vastly improved the PowerShift's performance, says Ford engineering manager Chris Kwasniewicz. But unlike European consumers, most American motorists haven't driven a stick shift, so they aren't accustomed to a dual clutch's more abrupt gear shifts. In 2011 "we found that North American customers were not really ready for this application yet," Kwasniewicz said. "European customers understood the startup shudder. They were used to that. They grew up with manuals and were accustomed to them." So Ford has asked dealers to explain PowerShift's characteristics to shoppers, he said. Their message: "Don't be rattled. It will act a little different. And it will deliver the fuel economy that you want." Sales personnel at Village Ford in Dearborn, Mich., took the company's advice to heart, said Bob Wheat, the dealership's sales manager. "If customers are prepared for it and understand it, then they have no issues," Wheat said. "People who haven't driven a manual transmission expect the car to be smooth as silk, so we have to set the right expectation level." While Ford is the target of Capstone's lawsuit, it isn't the only automaker that has struggled with dual-clutch issues. Honda Motor introduced an eight-speed dual-clutch transmission on the 2015 Acura TLX sedan, followed by the ILX compact sedan. To ensure smoother performance at low speeds, Honda added a torque converter, but complaints piled up anyway. SaferCar.gov has logged 38 reports from motorists who said their vehicles hesitated, surged or suffered from jerky shifts at low speeds. Gary Robinson, Acura's U.S. product chief, told Automotive News that Honda issued a software upgrade to improve the transmission's performance at low speeds. "We've made some good improvements -- mostly software," Robinson said. "I would say it's pretty normal with a new piece of technology. We are continuously improving it." Wheat: Tell customers what to expect. While Ford's and Honda's dual-clutch woes have attracted attention, other types of transmissions have experienced teething problems, too. Now, assorted transmission woes are showing up in J.D. Power's annual quality surveys. According to the research firm's most recent Initial Quality Study, transmission issues now are the seventh most frequent consumer complaint. Transmission problems ranked 10th in 2013, and eighth in 2014. As far back as 2009, transmissions were not a Top 10 problem in the IQS. For many years, conventional automatic gearboxes with four, five or six speeds generated very few complaints, said Renee Stephens, vice president of U.S. auto quality for J.D. Power. The auto industry "got really good at it," Stephens said. But new transmissions of all kinds have proved difficult to calibrate, she said: "The main problem is hesitation and shifting at inappropriate times, particularly at low speeds. If motorists press on the gas and it doesn't accelerate, then it's not meeting their expectations." So, will dual-clutch transmissions carve out a niche in the U.S.? This year, automakers are expected to sell 603,000 dual-clutch gearboxes in the United States -- about 3.5 percent of total U.S. light-vehicle sales, according to a forecast by IHS Automotive. By 2020, dual-clutch vehicle sales are expected to rise to 885,000, or 5 percent of total light-vehicle sales. So IHS Automotive expects the transmission's U.S. niche will expand -- but only a little bit. Dual-clutch transmissions "have taken a beating among consumers," said IHS researcher David Petrovski. "If people aren't used to it, they think something is wrong."